OCI is producing 303MW of electricity and 860t/hr of steam by constructing a cogeneration power plant in the Saemangeum Industrial Complex. Cogeneration Power Plant is a power system that produces heat and electricity by burning fuel such as bituminous coal. Steam, produced by the power plant, flows through a turbine, then is supplied to the industrial complex to improve heat utilization. In November 1989, the Korean government developed the general plan of the Saemanguem Industrial Complex which is to build the world’s longest seawall (33.9km) connecting Gunsan and Buan for effective land usage. The actual construction of the seawall was commenced in 1991, and the Saemangeum Seawall was completed in April 2010, after 19 years and 8 months of construction. In March 2011, the master plan for Saemangeum Development was established, which is to construct infrastructure of land and inner roads for eight sectors including a city complex, agricultural land, industrial land, etc. According to the plan, an industrial complex for the knowledge industry and an eco-friendly industrial hub is being constructed on 18.5km2 of land within Saemangeum. OCI established OCI SE to construct a cogeneration power plant within the Saemangeum Industrial Complex in July 2012. 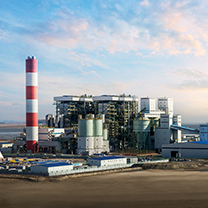 The plant, in which 590 billion KRW was invested, is capable of supplying 303MW of power and 860t/hr of steam to the industrial complex and neighboring areas. The plant is the first eco-friendly plant in Korea with best available technology (BAT) to minimize the generation of sulfur oxides, nitrogen, dust, etc. OCI plans to expand the heat supply system capable of district cooling and heating to distant areas according to the construction process of the Saemangeum Industrial Complex.